I don't buy navels, I get the Texas Valencias. They aren't as big and beautiful as a navel, but taste is Sooooooooo much better. I'm pretty sure the seeded oranges I have are Hamlin, very sweet and what they call commercially seedless. This means they have about six seeds, big round seeds. They are also very thin skinned. Take one Hamlin orange and squeeze out the juice in a small glass and add sangria wine and a cube of ice or two. Mexican this evening for supper....soft tortilla chicken chimichangas, guacamole salad, and rice. Killer good deals from the local grocery stores..going to be shopping this wkend. I had homemade pesto from my garden and spaghetti. Never heard of a soft chimmichonga. I thought they were fried. Not cheap but really good for Austin Tacos. 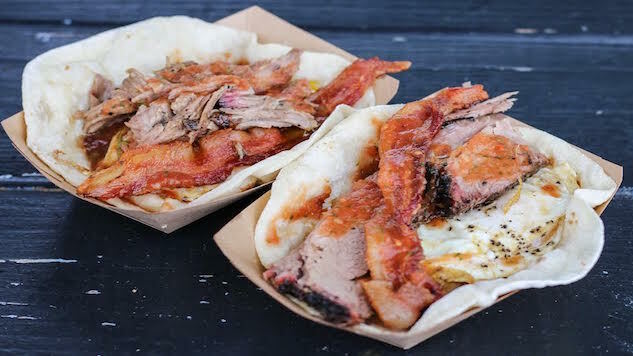 I had a taco at Valentina's BBQ in Austin this morning. It had a fried runny egg, refried beans, potatoes, bacon BBQ Brisket and salsa on it. Called The Real Deal Holyfield. I cant say one bad thing about it and the brisket was melt in your mouth and good too. Nice hearty breakfast, it looks good!!! Worth, the soft chimichangas are common here along with soft tacos which both are my preference. I can eat the fried but I like the soft best. All they are are flour tortillas that haven't been fried. That is what we would call a burrito here. In a moment of insanity I'm rendering out more lard. A whole cast iron kettle full. I also have quite the supply of cracklings in the freezer too. Here is a fried meat and pork fat and egg sandwich for breakfast. The meat including fat came out of the rendering vat and fried crispy with salt and black pepper. It was cooked before it was fried and mashed down flat with a spatula. Who doesn't like the crispy fried fat on a pork steak or chop, I know I do. Cost way less than a dollar to make and tasty too. Last edited by Worth1; 4 Weeks Ago at 11:58 AM. I see you stepped up your game to America's classic dinnerware, everything taste better on paper plates. Those tacos posted up a bit look fantastic! Grilled chicken thighs, corn, and fresh garden greens. The star of the show was the greens. I harvested some collard greens, mustard greens, Swiss chard; and Chinese cabbage today. I cut everything small so I could pack everything into a four gallon pot with the lid sitting on the greens.. At the end of three hours, the greens had reduced to about one gallon. Even my wife, who can be picky; commented on how good they tasted. I'm freezing most of the gallon of greens. I'm getting to the time in my garden when I need to start pulling and composting some really good garden greens in order to plant my summer tomatoes and peppers, and eggplant. We have really enjoyed the abundance of greens this winter, but life goes on. Now I'm looking forward to my first BLT of the summer with garden tomatoes. Glad you got your greens. I just finished putting up 3 quarts of lad and cooked some catfish in the remaining lard that wouldn't fill up a jar. I have a lot of lard and tallow now. Paper!! !,' The guy in the flea market parking lot told me they were Wedgwood.